Jackson Police say one person is dead following a Car vs Train collision near the intersection of Boling Street and Bullard Street in West Jackson on Thursday, July 13th, 2017. Jackson Police say Williams was killed in the accident when his car was split into two pieces and completely destroyed. Train collisions have been steadily on the decline since 1981 through 2016. In 1981, the earliest available year data was available, there were 9,461 collisions. In 2016, there were 2025 collision. A motorist is 20 times more likely to die in a collision with another motor vehicle and a train. Out of the 2,025 train collisions in 2016, there were 265 reported deaths and 798 injuries. A 30 car freight train hitting your car is the equivalent force of your car hitting a soda can. The average locomotives weight between 120 to 250 tons each. The average rail cars weigh between 30 tons empty to 140 tons loaded each, depending on what they are carrying. The average freight train weighs between 3,000 and 8,000 tons depending on the number of locomotives and freight cars. The Federal Railroad Administration (FRA – part of the U.S. Department of Transportation) encourages all drivers to take extra precautions when approaching train crossings and intersections to avoid Train Collision. 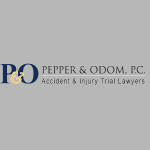 Pepper & Odom Injury Lawyers represent victims of train collisions who have been injured or killed due to the negligence of the Train and Rail Road companies.